Trounz ain't no ordinary Ponz. One year, news spread all over Kashmir about a strange looking creature. It looked like an ape but had very little flesh or muscles on it, it was thin, in fact it was bone and skeleton, and hence its name: trounz. Trounz was believed to have emerged from underneath the earth, somewhere near Baramulla. But some people recalled that in older times trounz could even be sighted in cities in great numbers. The truth however was that nobody knew anything about trounz. 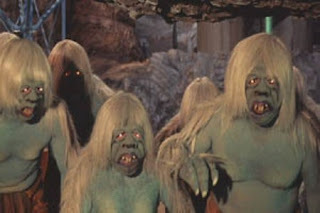 Image: Morlocks from the film H.G. Wells' The Time Machine(1960). Morlocks were a fictional species created by H. G. Wells for his 1895 novel, The Time Machine. Morlocks dwelled underground in the English countryside of A.D. 802,701 in a troglodyte civilization, maintaining ancient machines that they may or may not remember how to build. Their only access to the surface world is through a series of well structures that dot the countryside of future England. Thanks for the appreciation! I have done my fair bit of rant...what kind of Kashmiri wouldn't rant. But I found it all a waste. So I starting posting stuff that I would like to read about Kashmir. Readers have been nice to me...either they have been appreciative or they have left me to my own devices.